↑ "Trojan Product Specification Guide". https://web.archive.org/web/20130604020026/http://www.batteriesinaflash.com/specs/floodedleadacid/TrojanSpecs/Trojan%20Specification%20Sheet.pdf. Retrieved on جنوری 2014. ↑ Cowie, Ivan (13 جنوری 2014). 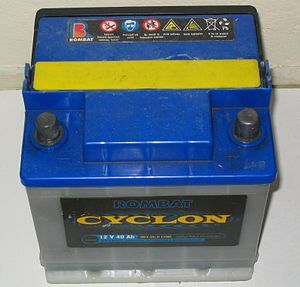 "All About Batteries, Part 3: Lead-Acid Batteries". UBM Canon. http://www.eetimes.com/author.asp?section_id=36&doc_id=1320644. Retrieved on 3 نومبر 2015.